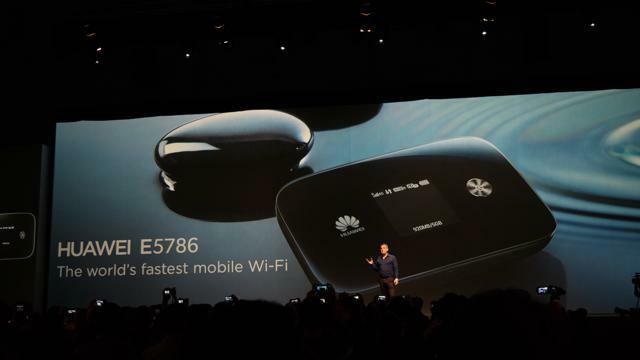 As the world’s first mobile Wi-Fi hotspot (MiFi), Huawei E5786 with LTE-Advanced (category 6) was presented a few months ago. The Huawei E5786 allows downlink speeds of up to 300 megabits per second; of course, the wireless network must be equipped accordingly. A 3000 mAh powerful battery provides up to 10 hours of operating time, thanks to Wi-Fi 802.11ac, the full LTE Category 6 speed can make true on the terminal used. The Huawei E5786 is the direct successor of Huawei E5776, which came to Germany in early 2013 on the market. Huawei have introduced the E5786 as the world’s first device that supports LTE-Advanced with up to 300 megabits per second in the downlink. The device is based on the the carrier aggregation technology for wireless transmission, depending on the cell bandwidth said top speeds are possible. In Germany, however, Carrier aggregation cannot use everywhere, but mainly in areas with high data volumes. Also, the launch date is not yet known – the provider Telefonica O2 , Vodafone and German Telekom are testing it diligently. The modem is made by Huawei subsidiary HiSilicon. In addition to LTE, Huawei E5786 also supports both UMTS including DC-HSPA+ (up to 42.2 Mbit/s in the downlink) and GSM/EDGE. A maximum of 10 devices can be connected wirelessly to the router via wireless 802.11a/b/g/n/ac, an additional device is also connected via micro-USB. The (non-removable battery) has a capacity of 3000 mAh and should provide about 10 hours of running time. Operation is via a web interface, as you already know it from other mobile Wi-Fi hotspots ago. Upon request, even other devices can be recharged via the Huawei E5786, if a suitable cable is available. Huawei calls this Reverse Charging technology. Reverse Charging is one of the many features of Huawei E5786. Under a cover of the Huawei E5786 side, there are two connectors for external antennas. Since the E5786 “only” 2 × 2 MIMO support, you also need only two terminals. Theoretically, the speed would be by 4 antennas, ie MIMO 4 × 4, again in need of improvement. Although the back of the Huawei E5786 can remove, the battery is built-in installed. Under the cover, there is a slot for SIM cards and a slot for MicroSD memory cards. A menu button on the top allows the operation of simple functions such as the wireless repeater function, which is already known on Huawei E5372.